The Giving Day photo booth has become a campus tradition. Donors and fundraisers dressed up for the occasion while paying tribute to UC Santa Cruz's famous mascot, Sammy the Slug. In comparison, last year’s Giving Day yielded around $600,000 in donations with 6,300 gifts for 160 projects, according to preliminary tallies. A pattern seems to be emerging; every year, donors and teams keep stepping up their gain, with more projects participating, more donors kicking in funds, and more money for teams. Giving Day aims to nurture and expand UC Santa Cruz’s culture of philanthropy, said Howard Heevner, assistant vice chancellor for University Development Programs, who is teaching a practicum course to undergraduate students that teaches the basics of fundraising including making your case, finding your advocates, and learning how to market your project.This course allows students to test what they learned with Giving Day, all for the sake of helping their UC Santa Cruz community. 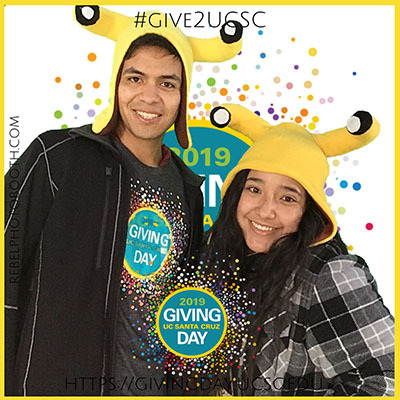 Though most of the activity took place online, Quarry Plaza was abuzz with activity throughout Giving Day, in spite of the gusty weather and occasional spatters of rain. Donors were pumping their fists, jumping up and down, wearing fuzzy Sammy the Slug hats, and posing for instant GIFs, which they posted online in between handing over cash or checks to their favorite projects. Francia Cruz (Oakes, sociology, ’20) was out raising funds and awareness for Services for Transfer and Re-entry Students (STARS), which is piloting a subsidized meal plan for transfer students who are parents, a wellness program for veteran students, and a professional development scholarship fund and career internship program aimed at transfers. Several groups were out tabling in the Quarry Plaza including the Don Rothman Dream Fund, which supports undocumented UC Santa Cruz students, including assistance with housing and textbooks as well as emotional and physical health, and the Gravitational Wave Astrophysics team of UC Santa Cruz, which is raising funds to send new undergraduates to Lick Observatory so they can make observations, analyze data, and make new discoveries about the universe. As usual, Giving Day used an appealing and accessible format to keep the gifts rolling in; the contest pitted teams of donors against one another in a good-natured sprint to the finish line, with the tension building as the clock wound down to the midnight deadline. Donors and curious onlookers could look at the interactive and constantly updated Giving Day website and track the results in real time. Every gift was tallied, ranging from online pledges to pocket change to large checks. Matches, created by donors, created strong incentives to give. “Challenges,” also funded by donors, pitted project teams against each other in a lighthearted way, creating bonuses for those that raised the most money in restricted time elements—from 6–8 p.m., for instance. This year’s top fundraisers included many familiar faces as well as a few newcomers. As of Friday, the Okinawa Memories Initiative raised the most funds, with 418 supporters kicking in $29,714. The Initiative, formerly the Gail Project, is designed to help undergraduate and graduate researchers gain valuable out-of-classroom experience from professionals while advocating Okinawan history. Proceeds from last year’s Giving Day helped the Initiative send a group to Okinawa to capture the stories of many local people. STEM diversity programs also triumphed on this year’s Giving Day, raising more than $23,000 with 333 supporters, making them “Campaign Heroes.” The program promotes diversity in the sciences by providing direct services that support students through STEM (science, technology, engineering, and math) research training, professional development, and academic support. The program supports underrepresented and underserved students, helping them to achieve their educational and career goals by giving them access to hands-on research experience and fostering a sense of inclusion, acceptance, and community. STEM Diversity Programs has mentored more than 1,500 students over the past 35 years, with a strong record of 155 Ph.D. students in STEM fields. The Pilipino Cultural Celebration, an annual production under the student organization Bayanihan, also received an impressive outpouring of support, with 346 supporters and more than $17,000 raised.